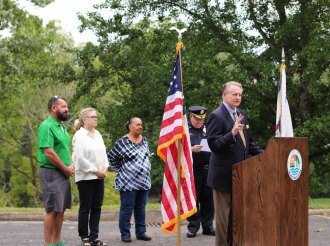 , to the community during a press conference Tuesday at Ritter Park. Dial said the new officers and new vehicles are the result of Williams’ vision to invest in the Police Department with “more cops and cars.” He also thanked City Council members for working in partnership with Williams’ administration and HPD. Toler and Hegemeyer graduated from the West Virginia State Police Academy last week and will now go through 14 weeks of field training at the Police Department. The new officers bring the sworn staffing level of the Police Department to 90. The department’s budgeted staffing level is 107. The department continues to accept applications from men and women seeking rewarding careers in law enforcement. For more information and to apply online, go to www.hpdrecruit.com. The five new patrol vehicles unveiled today were purchased and equipped at a cost of $227,712 in last year’s budget. 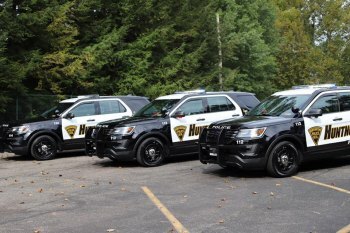 Five more patrol vehicles have been purchased at a cost of $225,593 in this year’s budget and should be in service by year’s end. The new design of the vehicles was initiated by HPD officers and created digitally by retired Police Officer Daniel Wiles and his wife, Ashley. The couple owns Westmo Media in Huntington. Dial also noted during the press conference that violent crime and property crime are both down 14 percent through the first 9 months of this year compared to the same time period last year, and the murder rate is down 50 percent.